It’s the time of year we begin digging our winter supply of potatoes and it’s also the time of year ( here in the North East) for amphibians to find a winter resting place. This toad was already hunkered down and cozying up to some spuds for his winter nap. Or he may have simply been trying out suitable sites. Our night time temperatures are dropping, though it’s plenty warm during the day and there are still plenty of insects for him to be munching. Best if he goes into winter with a good layer of fat, he’ll be relying on it for energy throughout the winter months. Thank goodness we didn’t hit him with the digging fork! Amazing that they survive our Maine winters burrowed into the soil. Nature has the great ability to provide its natural world with all the right tools, doesn’t it? While in dormancy, ice crystals will form in parts of a toad’s body cavity, as well as in its bladder and beneath its skin, but a high concentration of glucose in the frog’s vital organs will prevent it from completely freezing. Built in anti-freeze, you might call it! How cool is that! If you came across an amphibian in its winter state of dormancy, it may very well appear as being dead. Not so, but both its heart rate and breathing will most likely be nonexistent during its winter suspension. Once spring arrives, along with warmer temperatures, Mr. Toad will warm up and resume his normal activity. I moved our toad friend to the other end of the garden and along the forest edge. I’ll let him decide where he hops off to so he can find a good wintering-over spot. 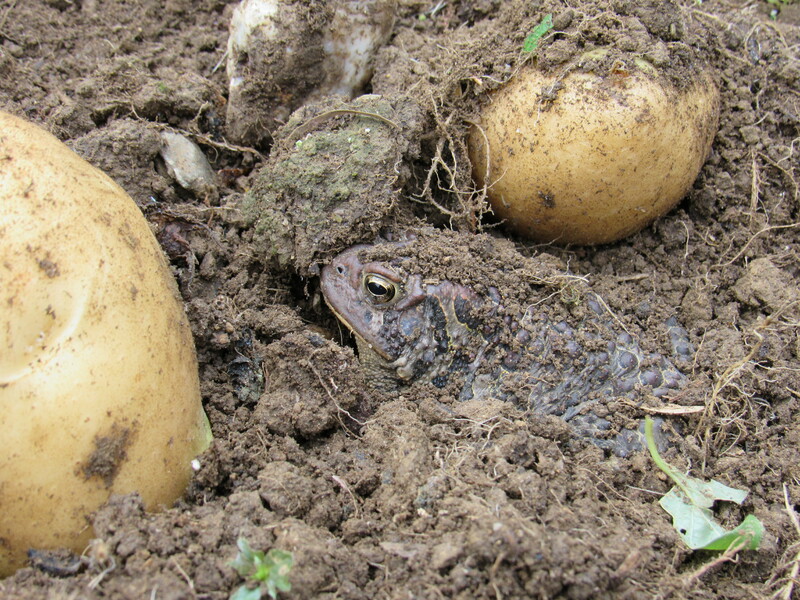 In the meantime, we’ll be very careful to just harvest taters…not toads! Mr. Toad says thank you for the transport to safer territory, and I say thank you for the biology lesson. Some days….some days… going into a suspended state of dormancy, giving the body a complete retreat to absolute ” slow -down ” , sounds pretty darn good! Welcome , home!! Always LOVE your writings, information and stories about life at Fernwood! Keep ’em coming !! Thank you! I am just hoping a( and relieved) that I’m not boring the pants off everyone…Always something going on here at Fernwood, so glad you enjoy the blog posts. It is fun for us to share a little of life here with folks, even if it means writing about ‘taters and toads’! Best to you, Sherillee! In your years of gardening at Fernwood have you noticed a decline in the number of toads you encounter? I, too, used to worry about slicing a poor toad with a shovel but now see only three or four a season. We grow organically. 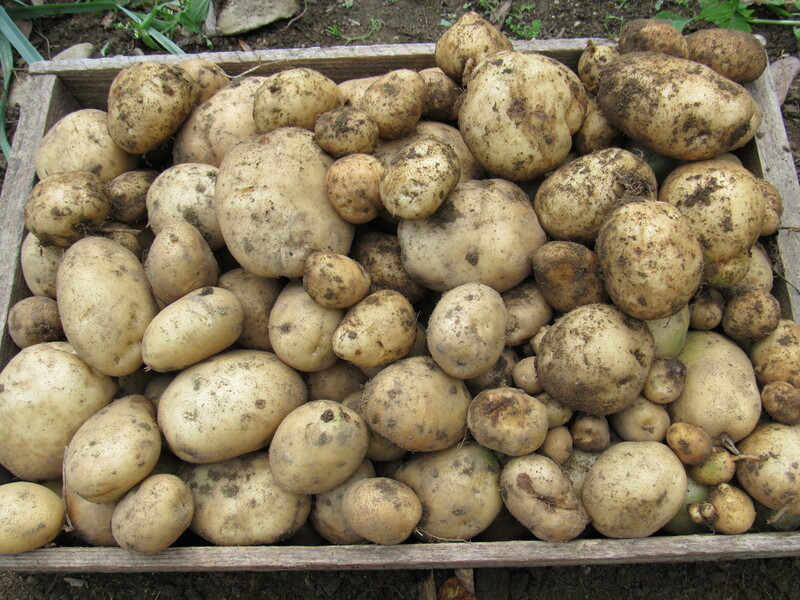 Not sure that I’ve seen a decline, yesterday…while digging potatoes I came across several. I’ve seen many throughout the summer.I’ll keep a real watch now, maybe write down the numbers and compare a few seasons to see if I detect a shortage or change. yes, hitting one with the digging fork would be just awful! Excellent!!! A film well done and with such an important message!I hope they show it in the school systems, would love to think were are helping young people to consider their food choices and the future of it. best to you, Sharon! I’ve never come across one when digging–now I have something new to worry about! Your information about how they survive the winter is fascinating! Potatoes out, toads in. Thanks for the lesson on how toads overwinter. I didn’t know it and now will be extra careful in my fall digging. I’ve always been amazed and fascinated by the adaptations animals and plants use to survive the cold..below freezing…north east winters. I use to teach winter ecology and these were my favorite topics. Yes, and we have to be thoughtful while digging our taters!